Salt Lake City, UT	- 24 Aug 2006: Agricultural technology company TekVet is using IBM (NYSE: IBM) services to power its wireless radio frequency identification technology that monitors the health of livestock to help ensure the safety of beef and dairy products. TekVet's livestock tracking, tracing and health monitoring technology is the first of its kind, allowing cattle producers and investors to remotely monitor the core body-temperature and other pertinent animal or herd data, as well as the specific location of individual cattle, real time, via the Internet. The historical and health information is collected and transported through an RFID sensor (TekSensor™) inserted in the ear of a cow. Information is then relayed to a collection of wireless receiving stations on a producer's lot. 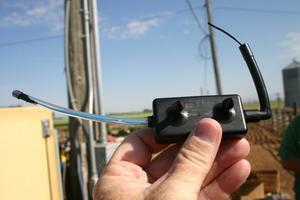 The transmitting range of the TekSensor is 300 to 500 feet. The data is transported via a private satellite network to TekVet's data center, where IBM System x servers, hosted by IBM, process information for millions of cattle at a time. to help safeguard the global food supply. TekVet customers can access the temperature and animal identification information online to evaluate the health of their cattle for a wide range of infections and medical conditions. This allows producers to take immediate action when precautionary measures are required, such as administering medication or segregating infected animals from the herd. It also provides more accurate and automated management of animals while providing crucial information for cattle investors, regulators, and ultimately, to consumers, who demand a safe food supply. TekVet invented the monitoring system in 2003 and is expanding globally, focusing its efforts in major beef producing countries throughout Latin America and Asia. The company selected IBM to host and manage its data centers to support the global growth of its business. The new agreement includes hardware support and maintenance, storage, helpdesk services, security management and network support. TekVet also recently signed an exclusive manufacturing agreement with Nationwide Electronics, based in Florida, who is responsible for meeting the worldwide demand for TekVet's products. "Timing is everything and we're the only company capable of offering this revolutionary technology throughout the world," said Tali Haleua, TekVet president, founder and chairman. "We required a hosting solution that could handle global market demand overnight and easily expand region by region. IBM's capabilities are unmatched and give us the solid foundation we need to keep our customers' herds constantly tracked, traced and monitored, which ultimately means a healthier end product for consumers."